Linguistics offers students an opportunity to engage in scientific study of human language. This includes the structures underlying sound (phonetics and phonology), form (syntax, morphology), and meaning (semantics, pragmatics). 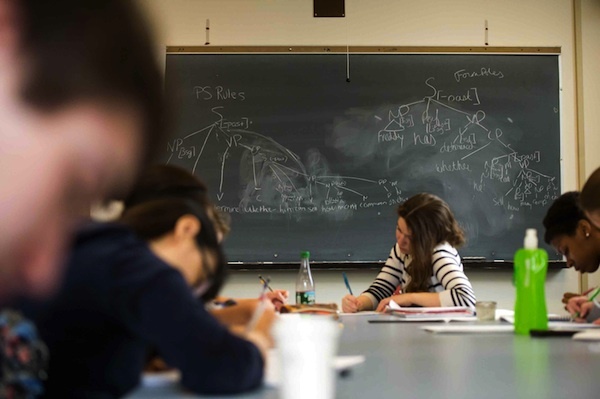 Our department emphasizes a balance of theoretical and empirical work that encourages the use of first-hand evidence and gives our students the ability to understand, challenge, and defend theoretical claims. We offer several programs of study that provide both a solid foundation in the discipline of linguistic analysis as well as the opportunity to pursue independent research. Undergraduates may pursue a bachelor of arts or minor in Linguistics. Students may also take one of several clusters. Our Lingusitics majors may also consider our special Masters programs in which they may complete an MA or MS in linguistics in the year following their BA. Our students learn to reason analytically, think critically, and express themselves clearly. As a result, they graduate prepared for advanced study or career opportunities, be it in linguistics or other fields, such as computer science, teaching, speech pathology, translating, or law. For further information about the field of linguistics, check out the Linguistics Society of America (LSA) website, and the publication Why Major in Linguistics?.